Italian physiologist; born at Genoa March 26, 1866; educated at the University of Modena (M.D. 1889). In 1888 he was appointed tutor, and later assistant professor, of experimental physiology at the University of Modena; in 1893 he assumed charge of the classes in special physiology, and in 1897 of the classes in histology, at the veterinary college connected with the same institution. In 1904 he was appointed editor of "L'Idea Sionista"; he is also vice-president of the Modena chapter of the Dante Alighieri Society. 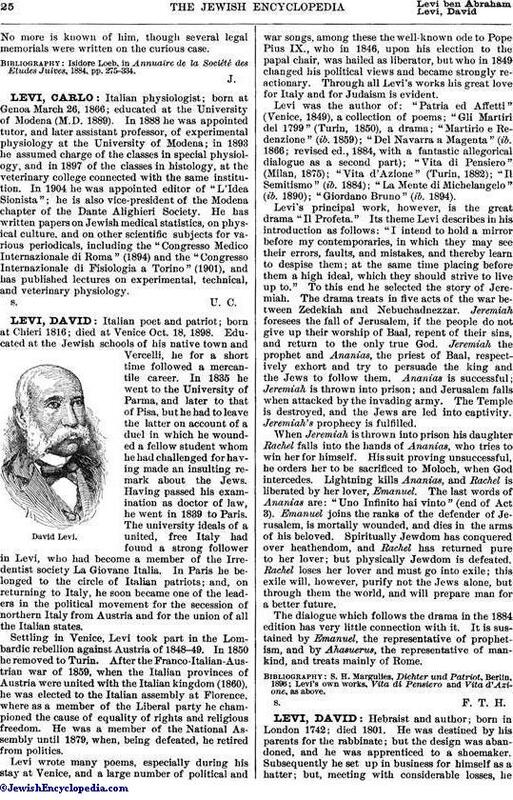 He has written papers on Jewish medical statistics, on physical culture, and on other scientific subjects for various periodicals, including the "Congresso Medico Internazionale di Roma" (1894) and the "Congresso Internazionale di Fisiologia a Torino" (1901), and has published lectures on experimental, technical, and veterinary physiology.